Author Doug Lemov is the managing director of Uncommon Schools, a consortium of 16 schools in Rochester, New York. 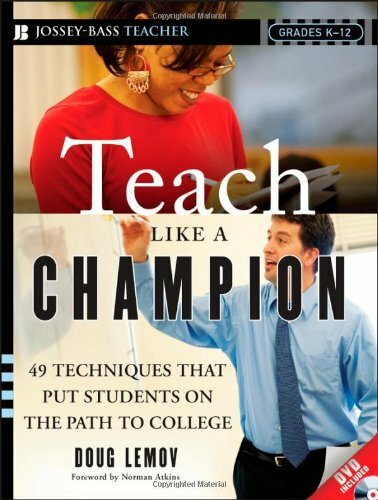 In Teach Like a Champion, Lemov has compiled 49 instructional techniques around seven basic tenets from his personal experience that outline how superior instruction can overcome socioeconomic barriers to student achievement. In the introduction to the book, Lemov includes data demonstrating that Uncommon Schools have surpassed achievement levels among various New York comparison groups. Part one of the book focuses on the 49 techniques and some additional strategies that he asserts positively impact student achievement. Part two is comprised of three chapters focused on reading instruction. Most educators would agree that strategies that positively impact the achievement of the most academically challenged students are the basis of sound classroom instruction, period; therefore, the book could easily serve as a solid resource for all classroom teachers. None of what Lemov chooses to include in his book is objectionable, but none if it is exactly new territory, either. His seven general principles (high expectations, planning, instructional delivery, engaging students, classroom culture, behavioral expectations, and building trust) have been touted by many educational researchers over the years, and his failure to cite independent research to support his assertions is problematic. Experienced educators will be familiar with the content contained in the book, because they will have encountered it through other avenues, such as project CRISS (Creating Independence through Student-Owned Strategies); Robert Marzano’s research on Classroom Instruction that Works, which organizes effective instruction around nine principals based on the statistical concept of “effect size;” Charlotte Danielson’s Frameworks, which divides quality instruction into the four domains (planning and instruction, classroom environment, instruction, and professional responsibilities); and others. If a school or district is looking for a way to organize its approach to staff development or quantify what it expects excellent instruction to look like, then Teach Like a Champion could potentially serve this purpose well. The book comes with a companion DVD demonstrating the 49 techniques that many will consider helpful. The book and DVD could easily be integrated in teacher preparation or induction programs, and could be a starting point to promote dialogue on effective instruction. However, beginning teachers should not consider the information exhaustive, and experienced teachers and administrators would need to be familiar with the research behind the information to truly maximize their classroom instruction or the feedback they provide teachers.